Gabriella is a computer programmer turned artist. She earned her undergraduate and graduate degrees in the field of computer sciences back in her home country of Hungary. When Gabriella’s children were ready to go off to pursue their own university educations, Gabriella decided it was time for her to go back too. She attended Emily Carr University of Arts in Vancouver earning her Bachelor of Fine Arts. 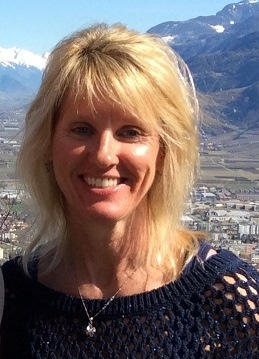 From here she earned her Masters of Fine Arts at Western University. She has had exhibits globally, appearing in Italy, Germany, United States, Japan, United Kingdom and Canada, most recently in London, Ontario. 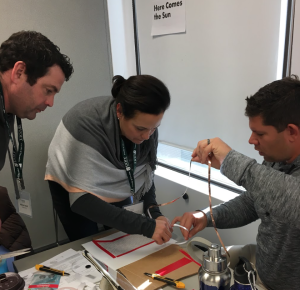 Gabriella presented at the Faculty of Education to lead K-8 teachers from across Ontario in circuit-based art projects. Below you can find her two workshop handouts as well as some photos of the day. For more information, refer to Gabriella’s website. 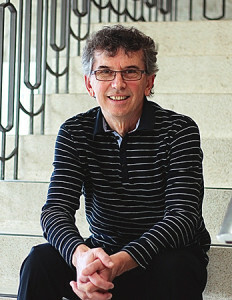 Dr. George Gadanidis is a Full Professor at Western University in the Faculty of Education. He is a Fellow of the Fields Institute and the recipient of a number of research and teaching awards. Each year George spends 50-60 days in elementary school classrooms collaborating with teachers to design innovative ways of engaging young children with big math ideas. His work is in mathematics, technology and the arts, with a recent focus on math and coding. Stephanie Thompson is an Academic and Research Associate at the University of Ontario Institute of Technology’s (UOIT) Faculty of Education. She earned her Bachelor’s degree from the University of Toronto before acquiring her Bachelor of Education from the Ontario Institute for the Study of Education (OISE) in the Junior/Intermediate division. Following this in 2014, Stephanie earned her Masters of Arts in Education in Digital Technologies from UOIT’s Faculty of Education. She spent over 10 years teaching and acting as a staff development facilitator/trainer for the Durham District School Board. She spoke at our CODE/Ministry of Education Makerspace Professional Development conference about assessment in this new learning environment. Wili Liberman is a writer and publisher and the founder of TEACH Magazine. 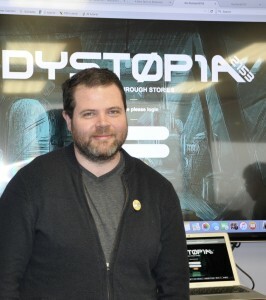 He is the author of half a dozen graphic novels including Dystopia2153. He is interested in how narrative and coding can be integrated and work together to tell a compelling story that will engage the reader in new ways. Wili is a graduate from the University of Toronto and DeMontfort University in the UK where he completed a Masters degree in Creative Writing with a focus on Teaching the Graphic Novel in the Classroom. 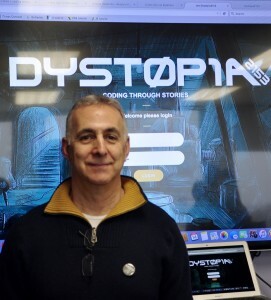 Click Here to check out Dystopia2153! 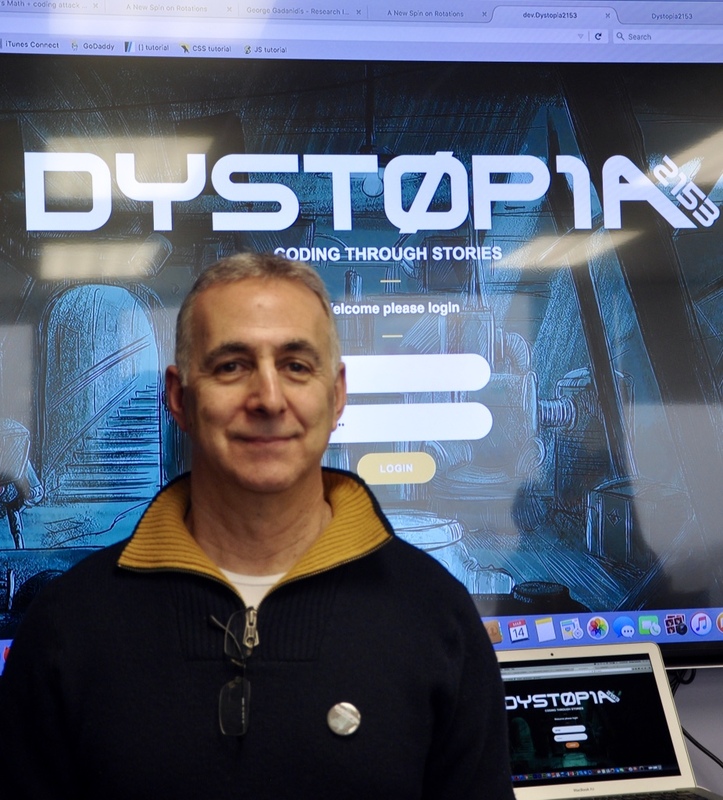 Rob King is a creative technologist, which means he is the programmer behind Dystopia2153 but also engages with technology in other ways. He programs lights for large scale installations, makes hardware in robots, both for artists and advertisers. He completed his education at Ryerson’s New Media program and completed a master’s degree with York-Ryerson in Communications and Culture. He works closely with Wili out of Toronto and hopes to see the program take flight and inspire the next generation of coders and storytellers.